Exchange Old 500 Rs and 1000 Rs Notes Online | How to Change? Modi Government Banned Old 500 Rs and 1000 Rs Notes from 08-Nov-2016 midnight on-words. 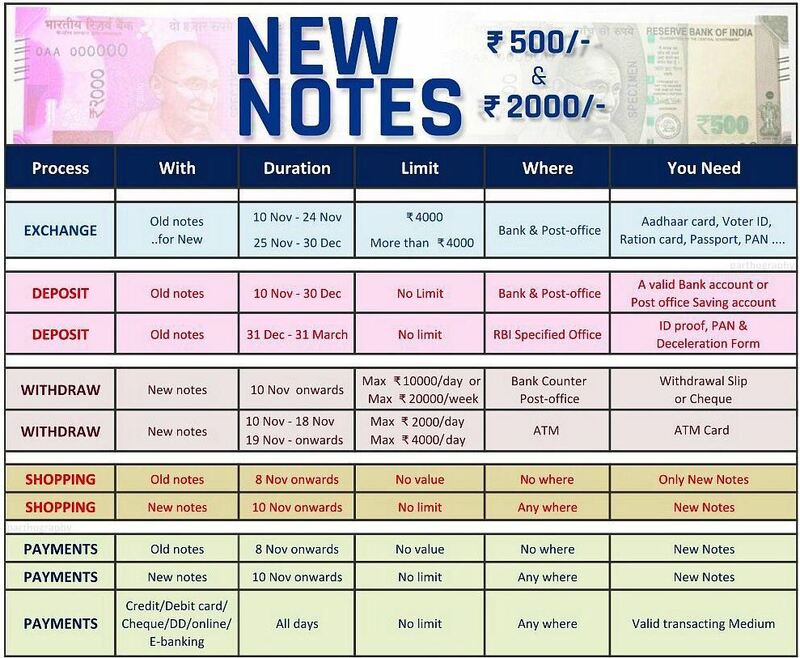 New 500 Rs and 2000 Rs notes will be available from 10-Nov-2016. How to Exchange/Change 500Rs and 1000rs notes? We can exchange 500 rs and 1000 rs notes from Banks and Post Office, there is no charges for exchanging money. Dec-31-2016 Last date for Exchange old 500 Rs and 1000 Rs money from banks and post office. You can exchange 500 rs and 1000rs old notes at Bank and post offices.and carry your any identity card to exchange your old 500rs and 1000rs notes before 30 December 2016. After 30 December 2016 your old 500rs and 1000rs notes will be exchanged at only in the RBI with the help of declaration. Deposit your old notes in bank and post offices before 30 December 2016, and you exchange your notes through bank and post offices till the date of 24 November 2016. The limit of the exchange is 4000 rs per daily. The old notes will be acceptable in government hospitals, railway, petrol and bus stations till 11 November 2016 and tourist can exchange the notes at airports. On November 10, 2016 - New notes are releasing in the market those are 500rs and 2000rs the proposal cleared by the reserve bank of India.